The best meal delivery kits bring fresh ingredients and nutritious recipes to your doorstep, allowing you to enjoy home-cooked meals even if you’re too busy to grocery shop. After trying out seven of the most popular meal delivery services, we found that HelloFresh, Plated, and Blue Apron outshone the competition, with cuisine that’s convenient to order, easy to cook, and delicious. 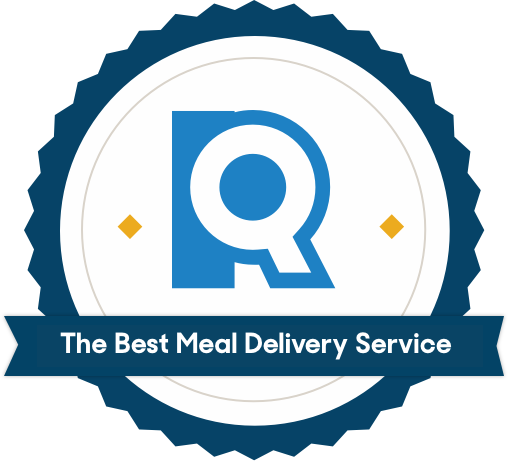 To be sure our home delivery meals weren’t falling into the restaurant trap, we averaged the nutritional information for 30 meals from each company. We wanted to see low sugar, high fiber and protein, and a range of 500 to 750 calories for each. According to dietitian Hanna Rifkin of Apples and Oranges Nutrition, the nutritional facts you find on food labels still aren’t as important as the list of ingredients. Ideally, you should cook with recognizable whole foods, plus a heap of vegetables. “Eat with your eyes,” says Rifkin. “Take a normal-sized plate, and fill half of it with vegetables, a quarter of it with a protein, and a quarter with some starchy thing like pasta or brown rice.” So, we also looked for companies whose meals were close to 50 percent vegetables. A major appeal of meal delivery kits is that they ease the hassle of home cooking. You don’t have to wander the aisles of the grocery store paralyzed by indecision. The meals just show up at your door. The more convenient a company can make this delivery process, the better. We measured delivery convenience in several ways: We looked for customizable delivery dates, punctual shipping, and refunds for missing or spoiled food. We also considered how much notice the service needed to skip our delivery any given week. 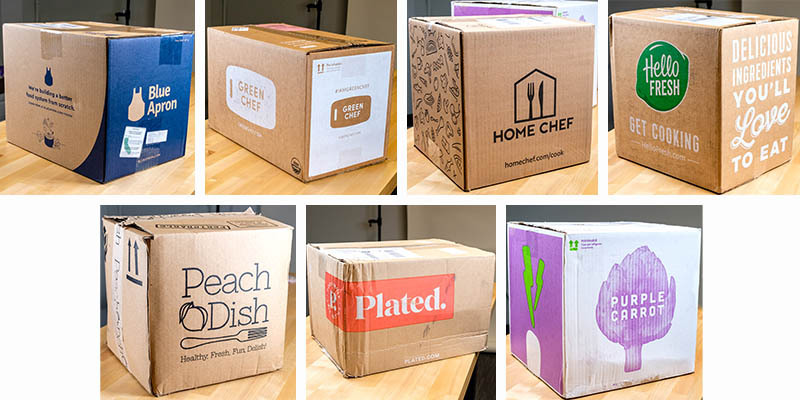 While most required a full seven days, HelloFresh earned points for its five-day cancellation policy. People with lots of cooking experience are going to have an easier time making most types of food. But meal delivery services should enable even cooking newbies to tackle whatever arrives in that box. Unfortunately, there’s one obvious problem with any meal delivery service: the huge amount of packaging waste. Every week, you have to find a way to dispose of the cardboard box, frozen gel packs, plastic baggies, and insulating material. We gave preference to companies that tried to mitigate the damage by using mostly recyclable packaging, by not individually wrapping ingredients whenever possible, and by using smaller cardboard boxes and compostable or recyclable insulation. Plated and HelloFresh were the standouts here, meeting all of the above criteria. There’s one big environmental upside to meal delivery services: They reduce food waste. It’s something we’ve all been guilty of from time to time. Maybe you buy an eggplant, but a recipe only uses half of it, and the other half sits in your fridge until it goes bad. With a meal delivery service, you typically receive only as much as you need. Everyone’s taste preferences are different, so while we asked whether each recipe tasted good, we also considered other factors. First, we looked at the ingredients themselves: Were they fresh and high-quality? Though we had to cut around black spots on a couple vegetables, the answer was generally “yes”. We also considered whether we’d make a given recipe again, and whether there was anything interesting or sophisticated about the recipe — like an unusual spice blend or a combination of textures that the average home cook might struggle to pull off by themselves. From the very beginning of the process, HelloFresh stood out. We love that the company delivers on any day of the week — though they do note options are limited in some regions. You can also skip a HelloFresh delivery on relatively short notice: five days in advance rather than the standard seven days required by other companies. Meal delivery services can be expensive because you’re paying for convenience. HelloFresh ties with Blue Apron for being the most cost-effective option. Meal delivery plans cost between $8.74 and $9.99 per serving, which is on the lower side for the kits we tested. Plus, when your delivery does arrive, it’s eco-friendly — or at least as eco-friendly as these boxes can be. Excessive packaging is a problem inherent to the industry, but HelloFresh reduces it as much as possible. It groups ingredients for the three different meals into three paper bags, so fewer things have to be individually wrapped in plastic, and depending on what season it is, the insulation is made of recyclable and/or compostable elements. 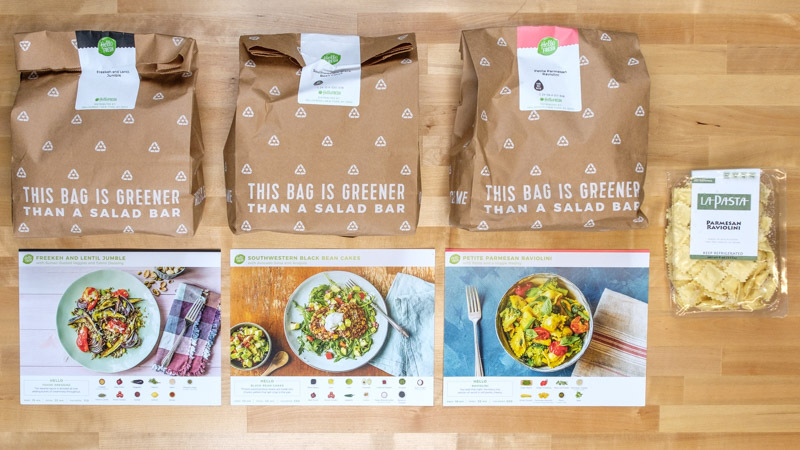 HelloFresh tries to mitigate packaging waste by bundling meal ingredients into paper bags rather than wrapping them individually. We loved the variety of our meals: The two-to-four dinners that come every week are notably distinct from each other, and recipes don’t repeat, so you get to enjoy new flavors all the time. One week you might dine on a traditional American meatloaf, shrimp farfalle, and an Asian-inspired honey-ginger chicken — all without any planning or grocery shopping. A common challenge when cooking on your own is getting stuck in a rut, and according to Emily Dellas, who runs First Class Cooking, “A lot of people just end up cooking the same thing over and over.” HelloFresh gives you all the adventure with none of the mental effort. While this wasn’t a dealbreaker for us, since generally there’s a workaround you can find online, it does add prep time to your meal and is something to consider if you’re a new cook or want to spend less time in the kitchen. Plated repeats meals more often, making multiple “encore recipes” available every single week. (Blue Apron and HelloFresh, on the other hand, rarely, if ever, repeat a recipe.) Again, for novice chefs, this is likely to be a draw: If you mess up a dish, you can hone your skills by trying again, making the same salmon poke bowl or chicken bruschetta several times until you feel comfortable with the process. You also get the chance to revisit a recipe you like without having to recreate the meal on your own — not true of our other recommendations. And the recipes Plated sent us were generally a little easier to make than the ones we got from HelloFresh, with one tester noting she was “shocked at how quick and easy” her Plated meal was. Clear and helpful recipe cards facilitate the learning process, offering a comprehensive list of all the equipment you’ll need before you dive in, plus tips that break down the cooking process. 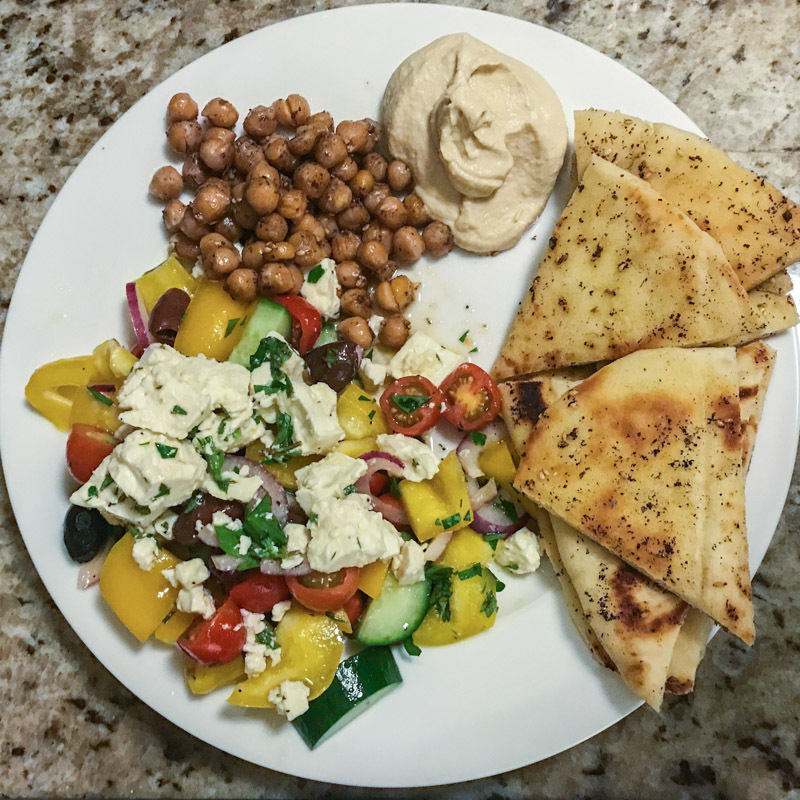 For example, Plated’s recipe for horiatiki (Greek salad) with chickpeas and flatbread didn’t just instruct us to scoop the seeds out of the cucumber — it also explained why (“Cucumber seeds contain a lot of water, so we’re removing them to keep moisture out of your salad”). Thoughtful touches like this made Plated feel more like a DIY cooking class than a meal kit. While Plated does mix things up with some Asian and Latin fusion dishes — meals that blend different recipes from those regions — the home food delivery service generally draws from fewer cuisines and styles, relying more heavily on traditional American fare like burgers. The reduced menu can boring for adventurous eaters, but it is good if you’re new to the kitchen and not sure you’re ready for a lentil-freekeh jumble. We weren’t wild about was Plated’s lack of transparency about nutritional information. While its meals fell within our calorie range (averaging 705 calories per meal) and came with a decent balance of protein and veggies, the sugar and fiber content information was nowhere to be found. When we inquired about it, we were told, “Unfortunately, we cannot provide the nutritional information that you requested.” That makes us suspect that Plated doesn’t think we’ll like the numbers. Blue Apron is the most recognizable meal delivery service (thanks in no small part to its ubiquitous podcast advertising), so we had high expectations going into testing. And it met those expectations — especially in the quality of its recipes. In fact, of all the meals we tested across all seven services, only one was so good that a tester attempted to recreate it on her own: Blue Apron’s Vietnamese-style vegetable sandwiches. (Her solo attempt wasn’t bad, she said, but definitely inferior to Blue Apron’s.) Other testers also reported saving their Blue Apron recipe cards to reuse. PeachDish provided tart shells that disintegrated before they were even out of their packaging, dolloped with a meager egg mixture that didn’t even fill up the shell. Blue Apron, on the other hand, sent a buttery, tender tart shell and instructed us to fill it with kale in addition to egg and onions, then paired it with remarkably tasty lemon-garlic roasted potatoes. 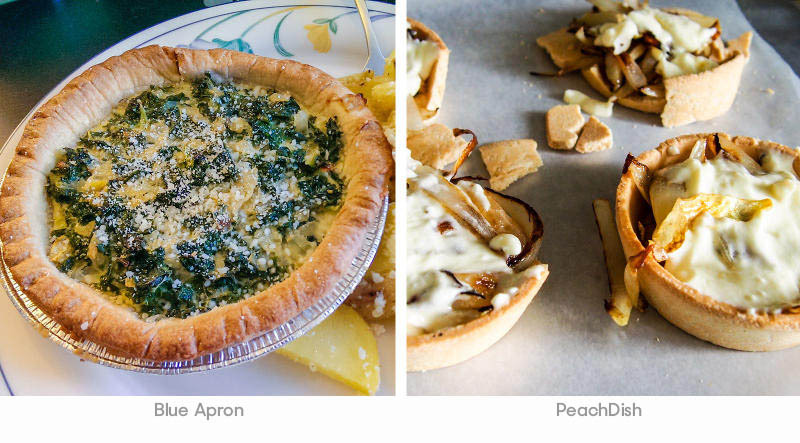 We found the Blue Apron’s ingredient combinations more creative than other finalists. Its risotto recipe, for example, was more sophisticated than the risottos from both Home Chef and Plated. Blue Apron’s recipe included a delicate interplay between tangy tomato paste, creamy mascarpone cheese, and a generous pinch of saffron, which one tester had never cooked with before. “I think there are experienced cooks who like to use meal delivery kits like Blue Apron to give them ideas for recipes or techniques,” confirmed Sarah Nelson, executive director of the community cooking school 18 Reasons. Blue Apron ties with HelloFresh as the cheapest meal delivery service, at $10 per meal per person for its two-person plan. And, if you have a four person household, servings are even less expensive. Its family plan is even cheaper and decreases in price depending on how many meals you get per week. Blue Apron is less convenient than our other top picks. While you can theoretically receive your box any day, the service defaults to Friday when you sign up — without mentioning that you have other options. (To switch, you’ll need to revisit your account settings post-signup.) If you want to skip a delivery, you also have to do it with a week of advance notice. A couple of our testers noted that the instructions on their recipe cards sometimes felt out-of-order, making Blue Apron a better option for cooks who already possess basic cooking skills (like preparing rice) and don’t need instructions at every step. That said, this shouldn’t be a dealbreaker if you’re interested in trying exciting new recipes and know your way around the kitchen. Meal delivery kits are great for both beginner and experienced cooks, but some kits are better suited to specific skill levels. Blue Apron, for example, is geared toward those who have a basic understanding of cooking whereas Plated is good for newer cooks. When choosing your home food delivery service, think about your cooking level and which kit will work best with your skills. PeachDish was an expensive outlier, with most meals costing about $12.50 per person, but sometimes reaching $18 or $20. Most meal delivery plans offer discounts or free trials for new users. Be sure to take full advantage of these deals before committing to a delivery service. The best meal kit service for you will be one with recipes you actually want to eat. This all boils down to preference and if you consider yourself an adventurous eater. Our testers loved Blue Apron’s innovative recipes and consistently voted them their favorites, but Plated offered recipes that were more traditional cuisine. HelloFresh, on the other hand, landed somewhere in between these two — balancing traditional and creative fare. Research each meal delivery service’s recipes before making your final decision to ensure they offer meals that work with your tastes. Are there gluten-free or paleo options? All of our top picks offer meat-based and vegetarian options, but if you have additional dietary restrictions, Green Chef is worth considering. It came in fourth overall, and while its food didn’t score quite as highly as our top picks, it does cater to a wide variety of diets, including vegan, gluten-free and paleo. In fact, testers preferred Green Chef’s veggie dishes to the vegan-only Purple Carrot, whose recipes sometimes felt unnecessarily complicated. Can I use less sugar in recipes? Yes, you don’t always have to follow recipes to the letter. If a meal delivery recipe calls for sugar or honey, try only using half of what’s called for. We used half the recommended sugar in a fig compote and half the recommended honey in a vinaigrette, and both turned out delicious. 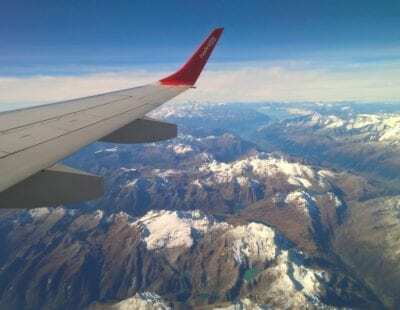 Should I be home for my meal kit delivery? No, you don’t have to be home when the box arrive. However, meal kits are kept fresh with frozen gel packs, which eventually melt. If your box sits on your doorstep for hours, any raw meat, poultry, or fish may warm up and become unsafe to eat. In fact, one study argues that shipping issues are an overlooked risk of meal delivery kits (the FDA is currently examining the issue). Regardless, it’s best to get food in the fridge ASAP and try to schedule deliveries for days when someone will be home — or even order vegetarian meals, which are less perishable. How do I recycle everything in my meal kit? Cardboard and plastics: Clean cardboard and most plastics can be put in your curbside recycling, but you’ll have to take plastic baggies to a supermarket or hardware store to recycle them. If your cardboard is soiled with grease or pieces of food, don’t throw it in the recycling — you should compost it instead. Freezer packs: All the services we tested used frozen gel packs to keep food cool during transit. To dispose of them, clip off a corner, pour the gel into the trash, and then recycle the plastic wrapper with other plastic baggies/films. 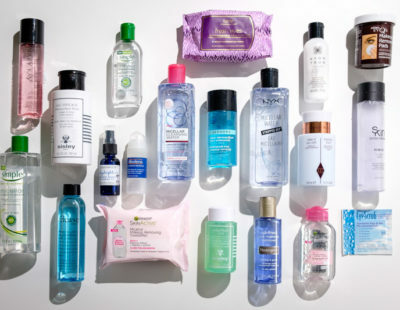 All of the companies we tested say the gel in their packs is nontoxic. Insulation: The meal delivery kits we tested used a variety of different materials as insulation to keep the boxes cool during transit. Most were recyclable and/or compostable, but you’ll have to check your favorite service’s website for details.